Christmas is very important to the people of Malta and its sister Island of Gozo. Most people on Malta are Catholics and go to a Midnight Mass Service. Usually the churches are full with people. In Maltese Happy/Merry Christmas is 'Il-Milied it-Tajjeb'. Happy/Merry Christmas in lots more languages. The Churches are decorated with lights and nativity cribs, 'Presepju', built by the church go-ers. The cribs are decorated with figurines, called 'pasturi' (representing figures like the shepherds and angels). Today some of the cribs are mechanical and the figures in them move! The figure of the baby Jesus is put on the main altar at midnight on Christmas night. At Epiphany it is traditional to put the three figures of the Magi (Wise Men) in the crib. 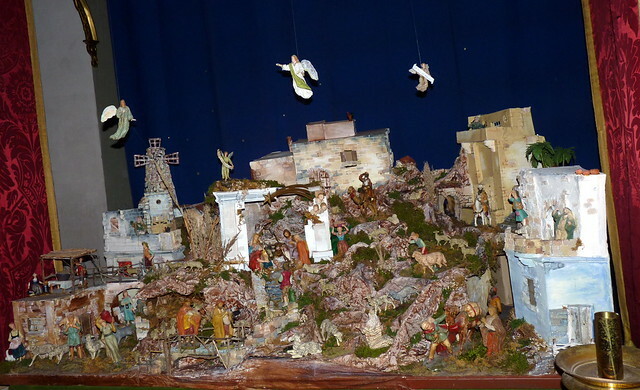 There is a group on Malta called 'Friends of the Crib' who help to keep the Maltese crib tradition alive. By the early to mid 20th century, cribs were thought of as old fashioned and not very popular anymore. To stop the decline of Christmas, in 1907, a priest called George Preca founded a children's charity and society called 'MUSEUM'. In 1921 he started a tradition of having a Christmas Eve procession with a life size figure of the Baby Jesus being carried at the head of the procession. In 1986 the 'Friends of the Crib' society was formed and now they have over 500 members. Every year, in the weeks running up to Christmas, the Friends put on a exhibition of about 100 cribs of all shapes and sizes. Maltese houses are often also decorated with cribs with 'pasturi' (which are small plastic or clay figures representing figures like the shepherds and angels). Large figures of the baby Jesus are sometimes put behind windows or in balconies and lit at night. Houses are also decorated with Christmas wreaths, candles and all sorts of other decorations. Every household also has a Christmas Tree decorated with light bulbs, tinsel and Christmas decorations. It is traditional to sow wheat, grain and canary seed, 'gulbiena', on cotton buds in flat pans five weeks before Christmas. These are left in dark corners in the house until the seeds produce white grass-like shoots. The pans with the fully-grown shoots are then used to decorate the crib or the statue of Baby Jesus. One Maltese Christmas tradition is the 'Priedka tat-Tifel' which means 'the preaching of the child'. A boy or a girl, normally aged 7 to 10, does the preaching of the sermon at the midnight mass instead of the priest! The children learn the sermon by heart and start learning it four or five weeks before they preach on Christmas Eve. The parents are also very excited and nervous about the performance, as they would have helped the children to learn the sermon. The boy or girl tells the story of the birth of Jesus in Bethlehem and is encouraged to give their sermon a personal delivery which will touch the hearts of the church-goers. George Sapiano delivered the first known Christmas Eve sermon by an altar boy in 1883, in the parish church of Luqa. It has also become common for local churches to organise a mini-pageant with children dressed up as shepherds, Joseph and Mary carrying a baby doll (representing Jesus) acting out the story of the Nativity. This re-enactment starts at 11pm and is followed by High Mass at midnight. A popular Maltese carol is 'ninni la tibkix izjed'. It means 'sleep and cry no more' and was written by the Jesuit Priest, Fr. Andrew Schembri (1774-1862) from Luqa for Maltese migrants in Tunis. There is a village on Malta called 'Siggiewi' dedicated to St. Nicholas, who is also known as San Niklaw, of Bari in Italy and its feast is celebrated on the last Sunday of June. Children on Malta get their presents from Santa Claus on Christmas night. Sometimes, Father Christmas comes knocking at doors early on Christmas night delivering presents! Schools in Malta often hold a Christmas concert. Most of the children take part. It consists of Christmas Carols, plays with a Christmas theme, mimes and poetry recitals, etc. It is enjoyed by the children and teachers alike. Christmas parties are also often held in each class. Sometimes the children bring food which their parents prepare at home and it is shared with every one in their class. Gifts are exchanged and sometimes money is collected which is given to charity. A concert and Christmas party is held every year at the Residential Home for the Disabled in Siggiewi. The residents take part in Christmas plays and carol singing helped by the people who work who work in the Home including Nuns. The Home is decorated and the atmosphere is great. The chapel is decorated with a beautiful crib with Baby Jesus. On Christmas Eve, a procession with the Baby Jesus is held and then Midnight Mass. Relatives of the residents also participate in the Christmas celebrations. Special food is prepared and the atmosphere is very happy! Voluntary organisations also organise Carol Singing evenings in old people's homes and hospitals, helping to cheer up the elderly and sick with the spirit of Christmas. Under the patronage of the President of Malta, the Community Chest Fund sets up a tent in Freedom Square in the town of Valletta, where volunteers help to raise donations of cash. The donations are then distributed to charity organisations such as orphanages and other charities, which often rely on donations to continue their work in the community. Maltese people have a wide range of food at Christmas. Traditionally, the Maltese house-wife kept the fattest capon/rooster, 'hasi', especially for Christmas Lunch, which was roasted at the local bakery in a casserole full of potatoes and vegetables. The traditional desert served at Christmas was the Treacle Ring, 'Qaghqa tal-Ghasel', and to finish it off, a hot Chestnut and Cocoa Soup, 'Imbuljuta tal-Qastan', which was and is served as a cosy night cap during the cold December days in Malta. Today the traditional Maltese menu has made way for Christmas Turkey, Christmas Cakes, Christmas Puddings and Mince Pies, all inherited during 164 years of British rule (1800 - 1964) in Malta. Italian Panetone has also become a Christmas favorite.